Gasteria vlokii is one of the more or less 23 known Gasteria species endemic to southern Africa. It is easily propagated from leaf cuttings or seeds. Plants more or less stemless, solitary, occasionally proliferating from the base to form small groups up to 140 mm in diameter. Roots succulent, up to 8mm in diameter, tapering to the ends. Leaves firm and leathery, in opposite pairs (distichous) when young, ultimately becoming a rosette (rosulate), 50-90 mm long, 20-30 mm broad at the base, curving to the side like a sickle, shaped like a tongue (lorate), at first spear-shaped (lanceolate) to triangular with an off-centre (eccentric) keel in the upper third, green with dense white spots in obscure transverse bands. The upper surface flat to slightly rounded (convex) becoming channelled during the dry season; lower surface convex; epidermis appearing smooth but very finely dotted with minute tubercles (asperulous). The leaf margin sharp (acute) ending in rough raised white tubercles, crenulate, becoming continuous towards the tip (apex) which ends sharply or is sometimes rounded (acute or obtuse), bearing a small white tooth (mucro). Flowers are borne on an extended flower stalk (inflorescence racemose), gracefully curved and spreading, 300-480 mm long, rarely with a pair of side branches. Flowers 20 to 36 tubular, 29-33 mm long, reddish pink, swollen towards the base and curved, their beaks (mouth) all pointing towards the rosette (secundly), and white towards the end. Stamens 15-20 mm long, anthers 2 mm long. Pollen yellow. Ovary 6-7 mm long. The fruiting capsule erect, 15-18 mm long, 6 mm in diameter. Seeds 3-5 mm long and 2 mm wide, black. Gasteria vlokii is related to G. ellaphieae from the Kouga Region near Hankey (growing in Albany Thicket vegetation) in the Eastern Cape and at once distinguished from G. ellaphieae by its almost smooth strap-shaped, slightly larger leaves, shorter inflorescence (300-480 mm) and longer flowers (28-33 mm). The inflorescence of G. ellaphieae is 600 mm tall bearing flowers 23-27 mm long. Flowering time: January to February. Plants are rarely encountered; they are not threatened due to their safe habitat, which is part of a protected site (Swartberg part of a reserve and a World Heritage Site). Plants have also been well established in cultivation. Gasteria vlokii is known only from a few localities: the top of Waboomsberg (also deep kloofs on the lower north face) which is part of the Groot Swartberg, and Witteberg north of Willowmore (150 km east of Waboomsberg). The Groot Swartberg is situated in the southern Cape and averages about 1300-1800 m in altitude. It consists of a hard quartzitic sandstone (Table Mountain Group) and its upper slopes, where G. vlokii occurs, carry Mountain Fynbos. The vegetation of the lower slope consists of Succulent Karoo with a preponderance of Portulacaria afra Jacq. G. vlokii grows at an altitude of about 1000-1500 m. The plants occur singly or in small groups wedged in crevices and shallow rock pockets in sandy humic acidic soils (pH 4,1) with a low mineral content in shady or exposed situations. When exposed, the leaves become tinged with red. Other succulent plants found in the habitat include Senecio crassulifolius, Crassula atropurpurea, Crassula ericoides subsp. tortuosa and Adromischus maculatus. G. vlokii is often found growing in moss amongst tufts of perennial grasses and restios. The climate is cool in winter with occasional snow, the summers are hot, but with cool nights. Rainfall, averaging about 800 mm per annum, occurs during winter and summer, with a tendency towards summer dryness. The Fynbos vegetation in the area consists of a dense evergreen sclerophyll shrubland (Protea lorifolia veld), 600-1000 mm tall, interspersed with occasional taller shrubs. The area is subject to veld fires but G. vlokii grows on the rock faces and is thus well protected. In spite of the high annual rainfall, the sheer rock slopes with shallow pockets dry out rapidly, ensuring a semi-arid habitat. 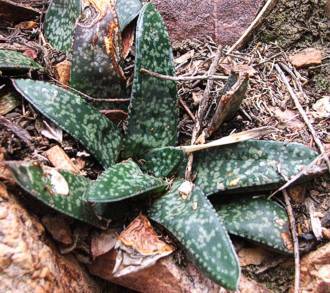 Gasteria vlokii was discovered by Jan Vlok, botanist from Oudtshoorn, on 26 December 1984, while exploring the upper eastern rock face of Waboomsberg (1946 m). His discovery came as a surprise as it represented the first record of a Gasteria confined to higher altitude moist fynbos (summer-dry adapted vegetation of the winter rainfall region in South Africa). Most other Gasteria species have been recorded from low altitude regions below the Great Escarpment and especially in semi-arid Albany Thicket, Succulent Karoo and Bushveld (Savanna) regions of southern Africa. Jan Vlok is an authority on the Flora of the Little Karoo and Albany Thicket vegetation of the Eastern Cape. The species was named by the author in 1987 in the Journal of the American Cactus and Succulent Society, and the specific epithet honours the discoverer. 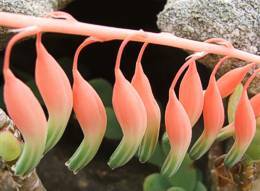 The tubular flowers are nectar-rich and Gasteria vlokii is pollinated by sunbirds during its flowering season in January. After pollination the capsules, which are carried on a lengthened inflorescence, become erect, typical of the Aloaceae family, and the black flattened seeds are dispersed by the wind. When grazed or disturbed, portions of the leaves become detached, and when lying on the ground or in crevices will root and colonize new ground. Gasteria vlokii is best grown in slightly acidic mineral-poor sandstone soil in fynbos gardens. It thrives as a pot plant on window sills or stoeps or on rockeries provided that frost is not severe. It prefers partial or dappled shade and grows well with other succulents. Plants can be given ample compost annually or fed with a organic fertilizer. Plants grow better on the shady side of rocks or below shrubs. Although best grown in acidic mineral-poor soil, it is tolerant of a wide range of soil types. 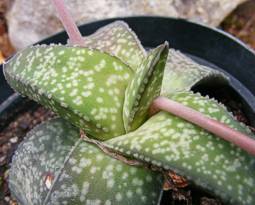 Gasteria vlokii is easily propagated from leaf cuttings or seed. Seed can be sown during spring or summer and germination takes place within 3 weeks. Cross-pollination of G. vlokii (as with most Gasteria species) is essential for the production of viable seed. In habitat the nectar-rich tubular flowers are pollinated by sunbirds. One clone of G. vlokii cultivated under controlled greenhouse conditions proved to be self-fertile. Seeds sown in autumn 1986 germinated within 3 to 6 weeks. Sow in a sandy well drained potting soil in a warm shady position in standard seed trays. The seedlings grow slowly. Cover with a thin layer of sand (1-2 mm) and keep moist. The seedlings can be planted out in individual bags as soon as they are large enough to handle. Leaves can also be placed in potting soil. After removing the leaf from the adult plant, let it lie for about 1 month for the leaf to form healing tissue. Lay it on its side with the basal parts in the soil. It should root within a month or two and small plants will proliferate from the leaf base. They can be planted out as soon as they are large and firm enough to handle. Van Jaarsveld, E.J. 1987. 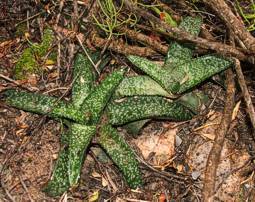 Gasteria vlokii: A new species from the South-East Cape. National Cactus and Succulent Society Journal ( US ) 59: 170-174. Van Jaarsveld, E.J. 1994. Gasterias of southern Africa. A new revision of a major succulent group. Fernwood Press and the National Botanical Institute, Cape Town.